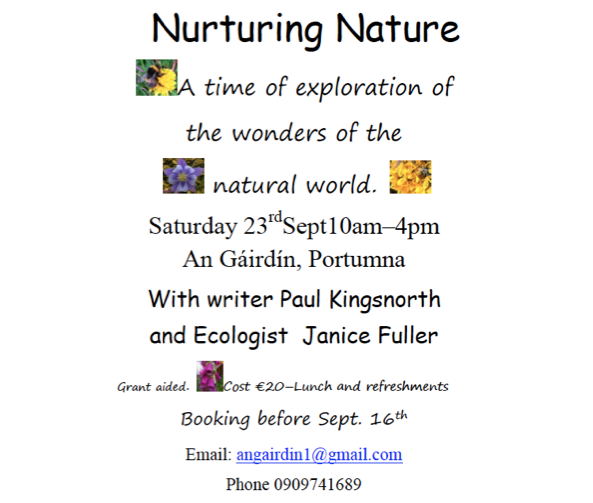 Our next day on Nurturing Nature is on September 23rd from 10am to 4pm. Writer Paul Kingsnorth and consultant ecologist Janice Fuller will facilitate the day. It will be a day of exploration of nature in our everyday lives. How can we reconnect with the wonders of the natural world in our own lives and communities? What can we do to communicate its importance to others? It will be a nourishing day on many levels. We will be both indoor and outdoor. The event is grant-aided. The cost is 20e for lunch and refreshments. To book email us at angairdin1@gmail.com or phone 0909741689 before September 16th.